Pain Free Living (web: SuperiorMagnetics.com) will offer pain relief for quilters at the Rusty Barn Quilt show Jan 29 - 31 at the Maricopa County Fairgrounds. Customers often report pain relief in seconds during a brief demonstration using Superior magnetic jewelry. 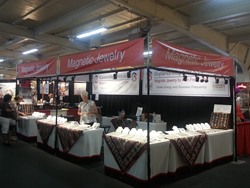 Superior Magnetics makes the strongest and fastest acting magnetic jewelry for pain relief. Magnetic bracelets are being used successfully by many people for pain relief of inflammatory conditions such as arthritis, tendinitis and bursitis. A randomized, placebo controlled trial with three parallel groups byTim Harlow, general practitioner1, Colin Greaves, research fellow2, Adrian White, senior research fellow3, Liz Brown, research assistant4, Anna Hart, statistician5, Edzard Ernst, professor of complementary medicine4, came to the conclusion: Pain from osteoarthritis of the hip and knee decreases when wearing magnetic bracelets. Pain Free Living with Superior Magnetics has 12 years experience in the alternative pain relief industry. Demonstrations of pain relief are available at fairs and festivals. For those unable to visit a show are pain relief products are available online at SuperiorMagnetics.com. This is the strongest and fastest acting magnetic bracelet for relieving pain.